Providing the perfect place to use as a base while exploring the French Riviera, Le Saint Aygulf Plage offers guests a wealth of amenities. Those who like to get sporty can unwind by playing boules, tennis and football and tournaments and matches are regularly organised by the dedicated entertainment staff. 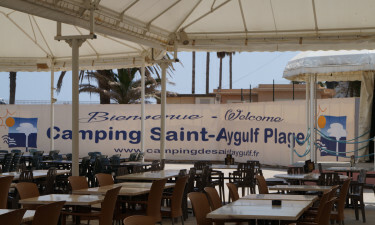 Learn more about Le Saint Aygulf Plage…. The team at LuxCamp present one the leading sites on the French Rivera, which is located just a short stroll from the city of Massif des Maures. In addition to exploring historical attractions, the kids are sure to have fun at the aquatic-themed Marineland amusement park. Why choose Le Saint Aygulf Plage? Guests will find a series of pretty paths leading right from their mobile home to a stunning sandy beach. This pathway continues along the coast to make it easy for guests to explore the area. 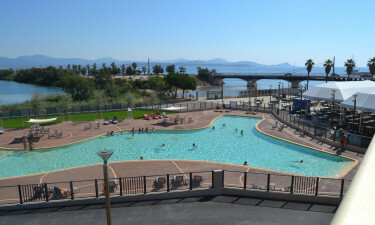 The centrally located outdoor swimming pool complex is one of the most impressive features of this luxury camping site. The large main pool is adjoined by a wading pool for small children as well as fun water jets.